Resolve Optics announces the Model 387 0.7x Wide Angle Adapter for optimised use with the Fujinon TF4XA-1 4mm HD lens for 3CCD cameras. The Model 387 provides a cost effective route to achieving a wide field-of-view for HD Broadcast applications with no loss of performance. The Model 387 converts the 4 mm focal length TF4XA-1 HD lens to a 2.8 mm focal length while maintaining its high definition 200 cycle performance across all the sensors of 1/3-inch 3-CCD or 3-CMOS cameras. In doing this the Model 387 usefully increases the horizontal field-of-view from 71 degrees to a minimum of 95 degrees. Dimensions of the Model 387 are 60.5 mm diameter and 34 mm long. The adapter mounts onto the TF4XA-1 via the 30.5 mm external thread on the front of the lens. 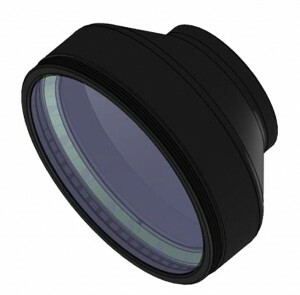 The Model 387 wide angle adapter has an M60 x0.5 thread on the front to facilitate the mounting of filters. For further information on the Model 387 please visit www.resolveoptics.com/387-000-0-7x-wide-angle-adapter/ or contact Resolve Optics Ltd. on +44-1494-777100 / sales@resolveoptics.com.